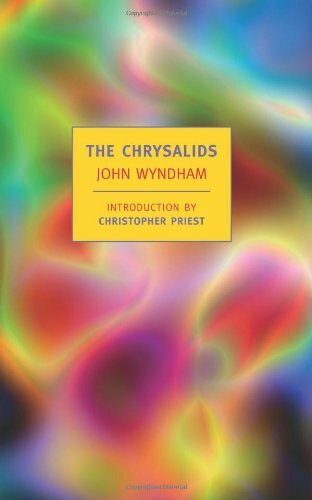 Set millennia after a nuclear holocaust, The Chrysalids by John Wyndham is a fascinating novel about a highly religious communities’ attempt to prevent mutation and evolution from occurring while struggling against a type of mutation they cannot detect. Their beliefs are based off of the Old Testament and a novel called Nicholases Repentances. The story focuses around a boy named David, a child with a very traditional father and a secret. He along with a small group of other children has the ability to communicate telepathically over long distances, however they communicate not with words but thoughts. These thoughts are described as abstract shapes and colors that are unique to each person with the mutation of telepathy in a way similar to handwriting. David, being quite young when the story begins, doesn’t understand the significance of his shared ability. He explains it to his uncle who tells him to keep it a secret, hinting to him the danger that he and his telepathic companions share. As he ages he begins to question his society’s view of mutants. This starts when he secretly befriends Sophie, a little six toed girl who lives hidden by her parents. It confuses young David, the idea that such a lovely, fun person could lack a soul and be satan spawn. Eventually he, his cousin Rosalind, little sister Petra, and the other telepathic mutants find themselves fearful of the rest of their society, but society may be more fearful of them. I found this novel entertaining and moving. The way areas changed by mutations are imagined is fascinating. The descriptions of telepathy and the relationships that people form with those that share their power make one long for a gift that doesn’t exist. Scenes, backgrounds, and relationships are crafted beautifully in such a way that they bring emotions and pictures to one’s mind in vivid detail. In this story readers watch the main protagonist, David grow from a curious and loving youth into a leader. The Chrysalids also focuses greatly on human psychology, specifically on how far people would go to defend themselves and the effects of fear on singular person as well as entire societies. The novel also touches upon other concepts and evil actions that are performed by people such as mutilation to prevent one from having children, torture, physical abuse, and a person loving someone who only wants them out of desperation. The themes of the book create tension that builds throughout the book. I personally preferred the beginning and middle of the story to the final chapters of the novel because the final chapters of the story focus less on David’s growth and more upon the fighting between the telepaths and the religious extremists. I would recommend this novel to more mature audiences because of the dark concepts contained although not focused on in The Chrysalids. To more mature audiences I would recommend this novel to those who enjoy coming of age stories and tales that focus on psychology.